Technology Services at FAA facilitates the acquisition and installation of computer software for administrative, instructional, and research purposes. 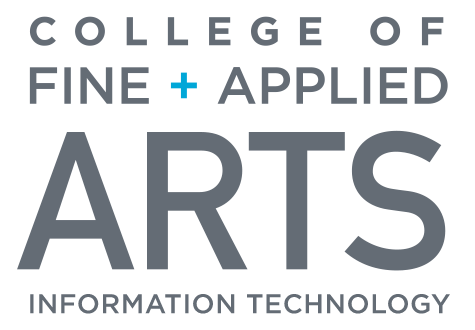 All faculty and staff within the College of Fine and Applied Arts who wish to purchase additional software for their university owned computers, including computer labs, are eligible for the service. Service is available Monday - Friday, 8:30 am - 5:00 pm. Purchasing software through Technology Services at FAA helps track purchases and renewals. It also gives the Webstore a single point of contact. Allows for the software to be owned by the proper individual or entity. Some software is eligible for special licensing that may allow for the use of concurrent licensing which reduces overall cost. This allows Technology Services at FAA to ensure compatibility and make recommendations for alternative software that may already be licensed. There is no charge for assistance in acquiring or installing software. Any software that has a licensing fee will be charged to your unit. Some packages may be licensed strictly for instructional use and not for research or administrative use. Technology Services at FAA partners with the University of Illinois Software Webstore for license management as well as distribution for a variety of titles. Any software to be purchased via Apple App Store. Any software to be purchased via Webstore. Any software to be used in an instructional computer lab. Cross Unit purchases (to allow Technology Services at FAA to track licensing and renewals for better savings). Your Unit may purchase software not listed above after consulting with Technology Services at FAA for security and compatibility. Any other pertinent information as needed. Please allow 3 business days for most software purchase. Please allow 5-10 business days for Apple software orders. Units should work with Technology Services at FAA for installation of all software. Technology Services at FAA has many software packages already configured that allow for remote installation. If you would like to request access to any of these titles for installation on an University-owned computer, please create a help request at the Technology Services at FAA Help Desk. For software licensing information, please contact theTechnology Services at FAA Help Desk. For Webstore specific questions, contact the Webstore.